In theory, Thomas McCarthy’s new film The Cobbler has a lot going for it. When you combine the director’s pedigree as an Oscar-nominated writer, being able to pull an Oscar-nominated acting performance out of Richard Jenkins for The Visitor, presenting his previous work at the festival, his low-key naturalistic dramatic style, you have, at least on paper, what could be a career-redefining role for Adam Sandler. Regrettably though, McCarthy fails to capitalize on any of these elements, resulting in a mess of a film that doesn’t know what it wants to be. 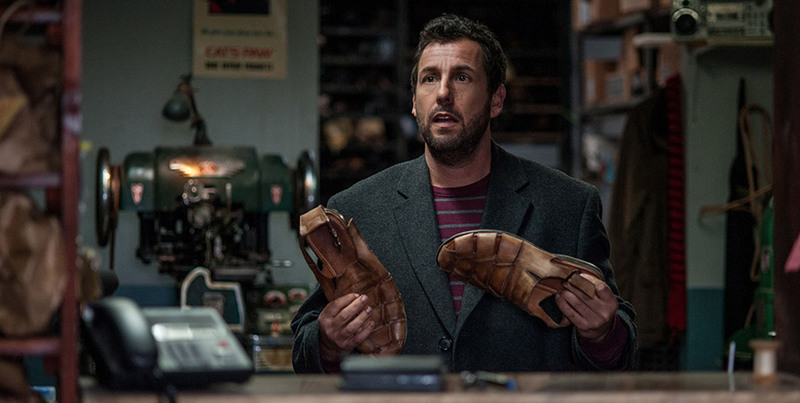 Passed down to him by his grandfather and father, Max Simkin (Adam Sandler) runs a shoe repair shop that has seen better days. Stuck in the rut of his daily life, Max is considering selling his land to real estate developers, much to the chagrin of a local woman trying to save the neighbourhood. When his equipment breaks down during a rush order, Max finds a family heirloom in the basement, an old hand-cranked stitching machine. He soon discovers that any pair of shoes repaired on this machine has magical powers. When he puts the shoes on, his appearance changes and he quite literally steps into the lives of the owner. Excited by the idea of being able to have adventures as other people, he soon discovers that he has the ability to fix more than just shoes. However, Max soon finds himself wrapped up in a life-or-death situation and works to save himself and his neighbourhood before it’s too late. The premise sounds like a recipe for a magical realism fantasy tale but in the end, the film ends up more closely resembling one of Sandler’s low-brow slapstick comedies that he continues to insist on making. The film bounces between farcical and heartfelt, with the look of a drama. The back story surrounding this machine is absurd and the characters Max transforms into are depicted in such a manner that at times they border on offensive. It’s hard to gauge the tone that the director was trying to achieve with the film, which in turn comes across as nothing like his earlier work that made him one to watch. The strong points of the film come in the tender, honest moments between Max and his mother (played by Lynn Cohen). He uses an old pair of his father’s shoes to become him for a night in order to resolve past issues and ask for forgiveness. This leads Max himself to try and finally figure out why his father left and never came back. This however, results in a “twist ending” that can be seen from a mile away, and thus we descend back into boorish comedy. The film is a step up from the comedy films Sandler is typically known for, so in that respect it has redeeming quality. If the viewer were to go into the film not expecting a film on par with the director’s previous work and just looking for a simple, mindless story, it could be enjoyable. But be warned. The Cobbler was jokingly nicknamed The Worst of the Festival for a reason.